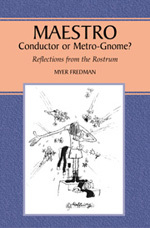 This book explains what is actually involved in being a conductor and unravels some of the mystique that surrounds this intensely public profession. The author, who has worked with orchestras and opera companies all over the world, writes about all aspects of the art and craft, and discusses how a career can progress and is the result of the observation of many conductors in action. The Craft that precedes Art sets out the musicianship requirements and physical gestures that have to be subconsciously embedded during formal training. Roads to the rostrum covers the differing needs of a permanent or a guest contract, the pitfalls of building a programme and relationships, be they with the orchestra’s leader, soloists, composers, the audience or the critics. In the theatre is about conducting for opera and dance as distinct from concert conducting, and the process of preparing opera for performance. Janus on the podium is a resumé of how conductors came into being and how they evolved into the powerful figures they are today. A pilgrim’s progress describes the author’s experience from his student days, to London, Glyndebourne and Australia as an example of how a career may unfold. The Index and Glossary of Terms provides easy to understand explanations of tempo indications, the numerous dance styles, symphonic poems, etc. Written in non-technical language, this book is essential reading for all music lovers, as well as professional aspiring maestri. Five minutes or a lifetime?